Perfect for any room including living rooms, bedrooms, kids, dorm rooms and Kitchen Cafe . These one of a kind curtains will help transform your room into your private sanctuary! Matches well with various color palettes of rugs, furniture and any other home decor accessories. iPrint blackout curtains can reduce light.They are also energy saving/efficient curtains. Environmentally friendly, no dye substance harming health of your family. With vibrant colors and clear images these curtains add a great perspective and completely change the look of your room. High resolution pictures bring 3D like realistic experience to your life. A perfect gift idea for your mom, dad, sister, brother, grandma, wife, husband and other beloved ones with thousands of designs. You can find a theme for everybody and any interest in our oobon Amazon Collection. Your home is where you spend a considerable part of your day. Enter into a new world with our items. Can be at the seashore and feel ocean waves or meditate while staring at mountain landscapes. Customized, personalized products are very popular. As manufacturers of digital printed home textiles, we follow current trends and bring you the latest home fashion. Either a gift to your family, friend, relative, boyfriend, girlfriend or to yourself, the item should be interesting, authentic. Men, women, kids, teens, boys or girls everybody will love them! Anyone from any profession will be thrilled by the difference these curtains bring to their house decor. The digital images we display have the most accurate color possible, however due to differences in computer monitors, we cannot be responsible for variations in color between the actual product and your screen. No hardware is included. Available in twelve different size options (55x39 Inch,55x45 Inch,84x63 Inch,84x84 Inch,84x95 Inch,108x63 Inch,108x72 Inch,108x84 Inch,108x90 Inch,108x95 Inch,108x108 Inch,120x66 Inch).Measurements are the total of the 2 curtain panels together.Perfect size for most living rooms & bedrooms & kitchen Cafe.If you need other size,pls contact us. Imported.Brand:iPrint.One-side printing, using heat dye sublimation technique, long-lasting effects. iPrint blackout curtains can reduce light. The darker the color, the better the light reducing capabilities.They are also energy saving/efficient curtains as they are made of materials with thermal insulation properties. They will prevent from heat escapes and blocks sunlight from entering into the room. Helping you to save on energy bills.These curtains are silky, soft, drapery and very pleasant to touch. Matches perfectly your windows, provides utmost privacy. 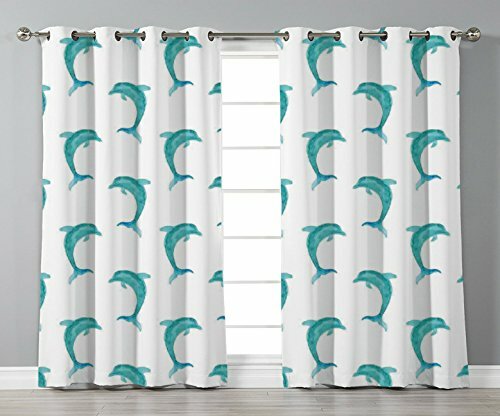 These amazing curtains are sold in 2 panels per package.Includes: 1x plastic bag + 2x Thermal Insulated Blackout Grommet Window Curtain Panels.Not Included: curtain rod or other hardware. MACHINE WASHABLE:On cold delicate cycle, Hang dry only.